The novel has four sections of four stories each, narrated in turn by one of the novel’s seven main characters. At the start of each section, a one-page Chinese parable (a short story with a moral) introduces the theme that connects the four stories that follow. The brief parables reflect the mothers’ own parenting styles throughout the book, as they teach their daughters lessons through stories that can be internalized, rather than direct opinions or warnings. As a child, Waverly learns not to whine for attention, because her mother tells her that the “wise guy, he not go against wind… strongest wind cannot be seen.” This lesson of stoicism drives Waverly’s eventual success, both as a child chess champion and as a strong-willed professional. The style mimics the Chinese tradition of oral storytelling, where family history is passed along and immortalized through generations. More than just communicating advice, storytelling allows historical context and a stronger connection to Chinese heritage to be passed on, which fades as children become more Americanized and less interested in inheriting ancient proverbs. Tradition is vital to the development of personal values in The Joy Luck Club, and slowly becomes important to the daughters as they get older and realize the relevance, and strength, of all the stories and inherited customs within their own lives. The mothers’ longer narratives in each chapter often address their daughters, and storytelling acts as a way to transfer wisdom through personal experience. Suyuan repeats a story to June about escaping Kweilin, changing the ending each time as June grows older. When she’s finally mature enough to comprehend the gravity of Suyuan’s loss, June is told the whole story about the twins’ abandonment and her mother’s first husband’s death. The story makes June confront the meanings of sacrifice, love, and despair more viscerally than simply being instructed to not take things for granted. The ThemeTracker below shows where, and to what degree, the theme of Storytelling and Tradition appears in each chapter of The Joy Luck Club. Click or tap on any chapter to read its Summary & Analysis. Below you will find the important quotes in The Joy Luck Club related to the theme of Storytelling and Tradition. In America I will have a daughter just like me. But over there nobody will say her worth is measured by the loudness of her husband’s belch. Over there nobody will look down on her, because I will make her speak only perfect American English. 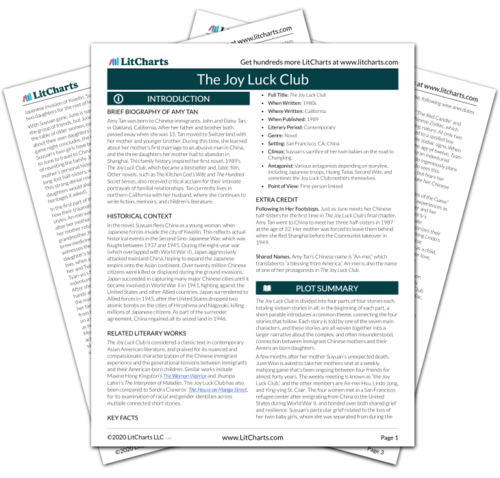 Unlock explanations and citation info for this and every other The Joy Luck Club quote. “This feather may look worthless, but it comes from afar and carries with it all my good intentions." And she waited, year after year, for the day she could tell her daughter this in perfect American English. My mother took her flesh and put it in the soup. She cooked magic in the ancient tradition to try to cure her mother this one last time. She opened Popo’s mouth, already too tight from trying to keep her spirit in. She fed her this soup, but that night Popo flew away with her illness. Even though I was young, I could see the pain of the flesh and the worth of the pain. I had no choice, now or later. That was how backward families in the country were. We were always the last to give up stupid old-fashioned customs. In other cities already, a man could choose his own wife, with his parents’ permission of course. But we were cut off from this new type of thought. You never heard if ideas were better in another city, only if they were worse. “It is what you want but cannot ask,” said Amah. "This is because…because if you ask it…it is no longer a wish but a selfish desire," said Amah. "Haven’t I taught you – that it is wrong to think of your own needs? A girl can never ask, only listen." I was six when my mother taught me the art of invisible strength. It was a strategy for winning arguments, respect from others, and eventually, though neither of us knew it at the time, chess games. To this day, I believe my mother has the mysterious ability to see things before they happen. She has a Chinese saying for what she knows. Chunwang chihan: if the lips are gone, the teeth will be cold. Which means, I suppose, one thing is always the result of another. The minute our train leaves the Hong Kong border and enters Shenzhen, China, I feel different. I can feel the skin on my forehead tingling, my blood rushing through a new course, my bones aching with a familiar old pain. And I think, My mother was right. I am becoming Chinese. I look at their faces again and see no trace of my mother in them. Yet they still look familiar. And now I also see what part of me is Chinese. It is so obvious. It is my family. It is in our blood. After all these years, I can finally be let go. Ogi, Alyssa. "The Joy Luck Club Themes: Storytelling and Tradition." LitCharts. LitCharts LLC, 24 Jul 2015. Web. 17 Apr 2019. Ogi, Alyssa. "The Joy Luck Club Themes: Storytelling and Tradition." LitCharts LLC, July 24, 2015. Retrieved April 17, 2019. https://www.litcharts.com/lit/the-joy-luck-club/themes/storytelling-and-tradition.